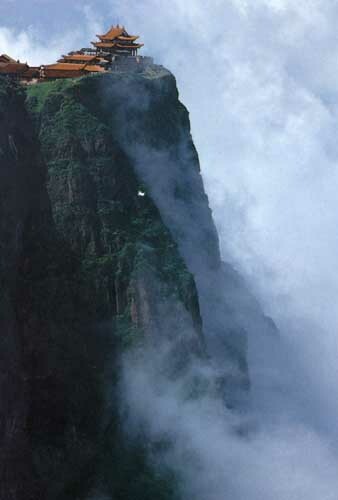 Mount Emei is called the “mountain of brightness” in Buddhism. The first Buddhist temple in China was built here ( East of Leshan City - Sichuan Province ), in the 1st century A.D. in the beautiful surroundings of the summit Mount Emei. The addition of other temples turned the site into one of Buddhism's holiest sites (Site of Rituals to Samantabhadra Bodhisattva). Over the centuries, the cultural treasures grew in number. On the mount stand more than 30 ancient temples. Most famous are the Baoguo, Fuhu, Wannian, and Huazang temples. Wannian Temple houses a 62-ton bronze statue of Samantabhadra riding an elephant that dates back to the Northern Song Dynasty (960-1127). The Fuhu Temple is the largest temple for nuns and is surrounded with ancient trees. Because falling leaves are never found on its roof, it has been dubbed "the temple without dirty objects." The Baoguo Temple, at its foot, was founded in the 17th century. Typical of the temples on Mount Emei, it has a courtyard adorned with a flower nursery, garden and pavilions. The Mount Emei Buddhism Association is located there, and major religious activities are held without its walls.